We ran an exciting preview of the brand new Wine & Type Tasting event for 30 ambassadors from the Bankside Design District. We had a brilliant time and the evening was pronounced “a roaring success”. Favourite quotes included “so unexpected but in all the right ways!” and “lots of sublime and crazy tall tales from the past”. We are disrupting the traditional wine tasting format to create a brand new and immersive experience of discovery for the London Design Festival. Games and activities will challenge your assumptions and tease your senses, all delivered with a dash of theatre. The journey is enriched by a sequence of superb wines, each of which has been chosen to amplify a key moment in the narrative like the dramatic soundtrack in a movie. Find out how the exciting, tumultuous, and sometimes dark, history of printing has shaped the world we live in today. Meet the innovators who changed everything by giving the everyman a voice, and empowering him/her to challenge the status quo. But be prepared for the consequences. Explore the ancient origins of the covert messages hidden in plain sight, which alter the meanings of the very words you read and are still influencing you today. Find yourself in the Old World; plunged into divisive name-calling, fake news, propaganda and be prepared the explosive repercussions. Discover how the fantastical names used as advertising tools in a New World of ideas and industrialisation give you clues to the themes of the Victorian zeitgeist. One wine served three ways. Indulge in a personalised tasting experience with sound, smell, type and touch. “So unexpected but in all the right ways!”, “Brilliant evening”, “Sublime and crazy tall tales from the past”, “Wonderful evening”, “A roaring success”. Learn about the dramatic impact of type and how it has shaped our world at a unique wine tasting event. Author Sarah Hyndman will take guests on a time travelling journey through pivotal times when she considers that type has been the catalyst for change. Co-host and wine expert Grant Hedley has paired each with a delicious wine, which will be served with activities and stimuli for all the senses as each story is brought to life. What do the fonts you encounter every day reveal about attitudes, the zeitgeist, cultural change, history repeating, faked news and the modern world? Find out how type was on the front line of revolutions and change, not only to spread the message, but sometimes as the trigger that caused them. The incredible history of type is brought to life as you find out how typefaces not only changed the world but that their power still resonates. These are the stories of a hacked wine press, the original disruptors, entrepreneurial perseverance, explorers, inventors, revolutions, nostalgia, authenticity, and our vision for the future of type and wine based on trend predictions. 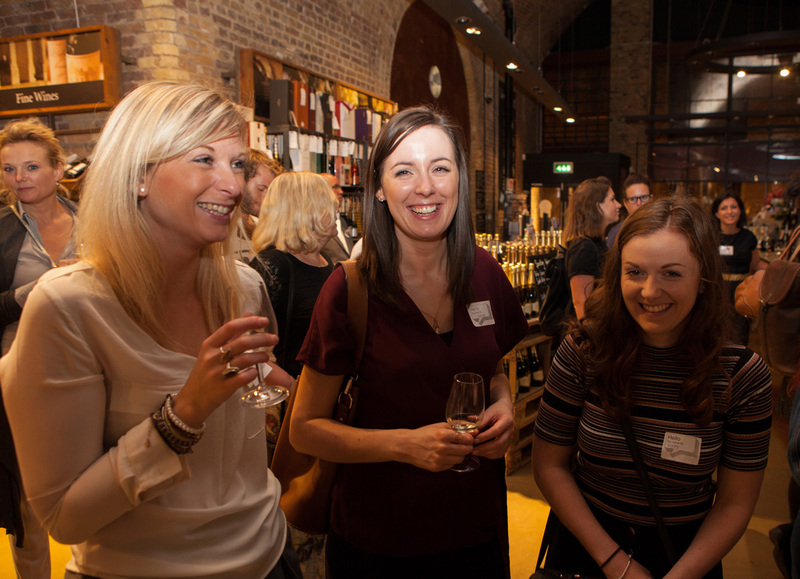 Join us at Laithwaite’s, an amazing venue in the atmospheric Victorian railway arches next to Borough Market. No prior knowledge of (or interest in) type or design is necessary (over 18s only). How about a Gin and Type Tasting? When the days start to get shorter, why not arrange a Type Tasting to brighten up an evening? 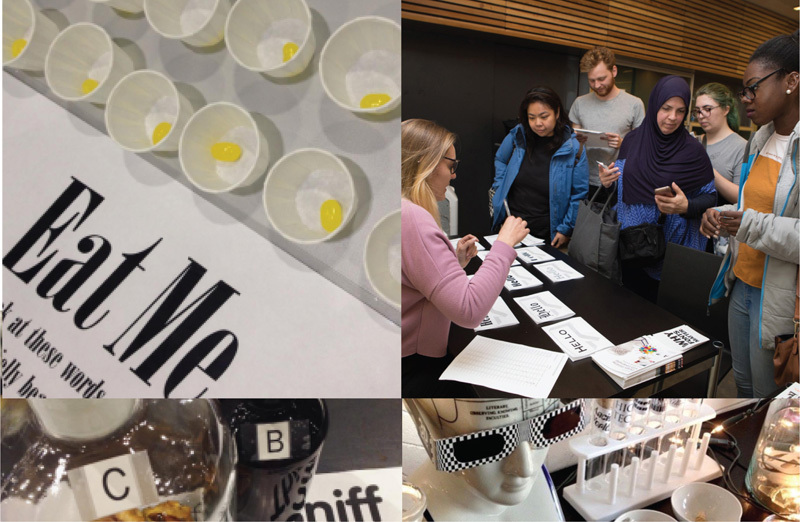 Choose from a creative typography session to refuel your team away from the computers, a wine tasting evening as a company social, or a type perception masterclass to inform and entertain. A social evening designed to refresh your team’s creativity as they roll up their sleeves to experiment with typography and markmaking materials away from the computer. The workshop can come to you, or it can be hosted for up to 15 participants in the Type Tasting studio in London. Typographic rebellion: Explore how type gives angst and rebellion a voice and create your own typographic expletives. 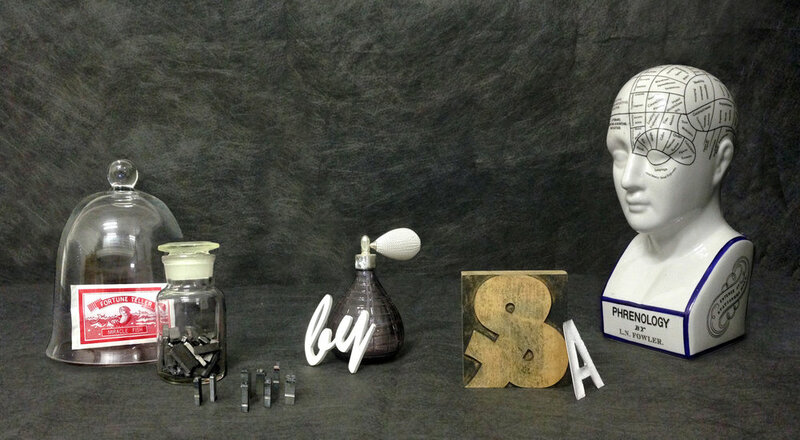 Type and sound: Use sound stimuli to inspire your creative typography and idea generation. 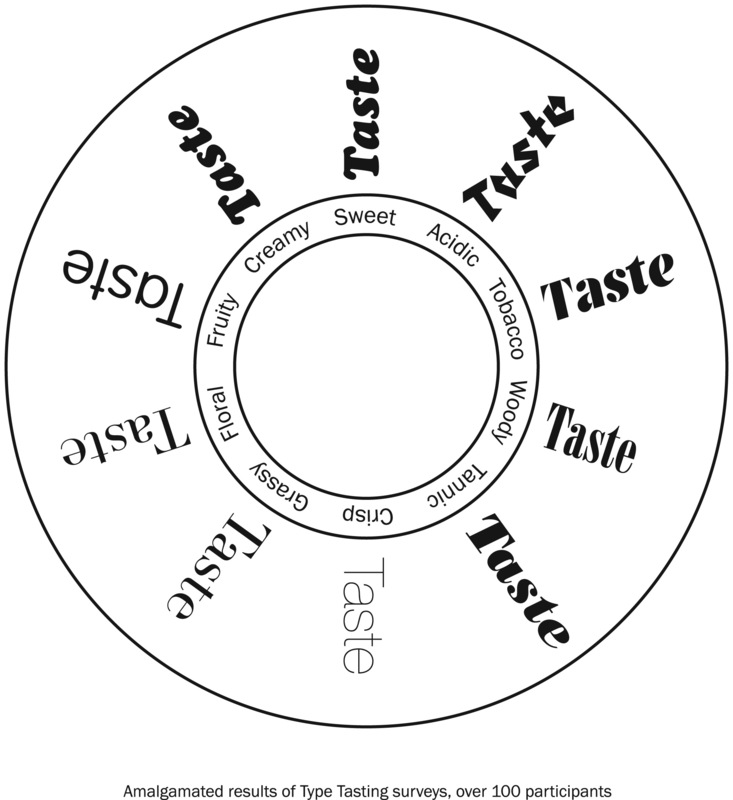 Type and taste: Explore how taste can be represented typographically, based on research with the Crossmodal Research Laboratory. 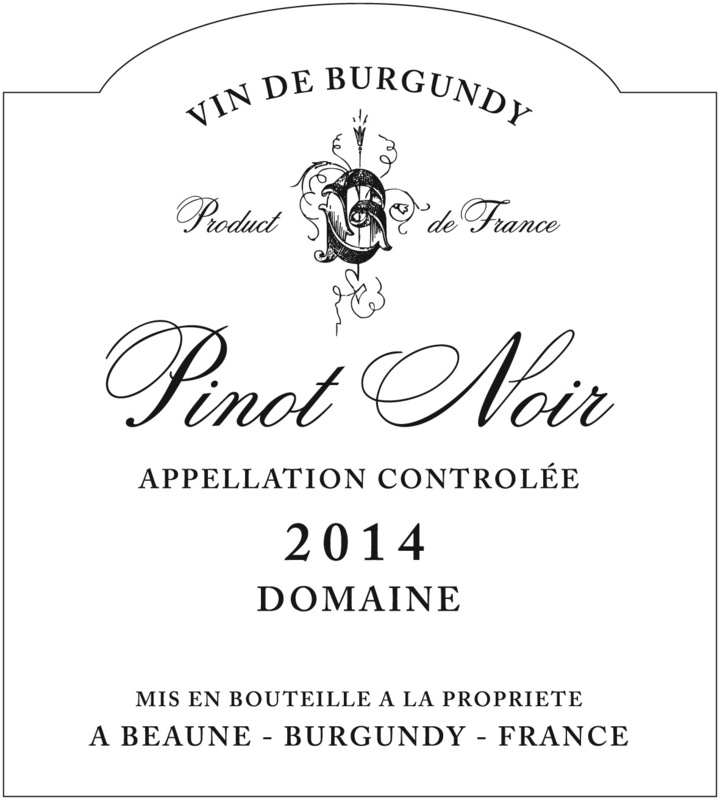 Do you Judge a Wine by its Label? A new wine and type tasting evening, based on the sell-out success at the London Design Festival. Take part in a series of activities and games that will delight and inform, in a relaxed and social setting. We will bring this innovative type and wine tasting, based on the sell-out success at the London Design Festival, to you for your team and clients. Take part in a series of activities and games that will delight and inform, in a relaxed and social setting. What does the design of the label tell you about a product? How does this influence your expectations and even what you taste? Typography is not just visual; it conveys sound; it is tactile; it can smell of roses or coffee; and you know at a glance whether it is sour or sweet. 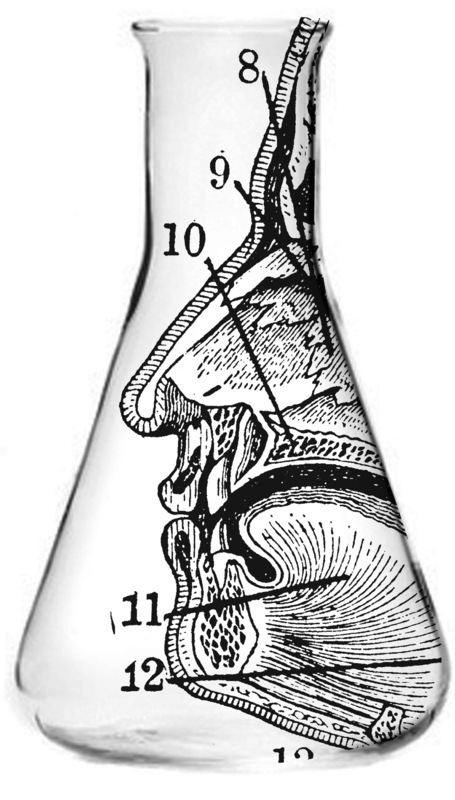 Learn about the science of taste and the senses; how design can influence what you drink; and ultimately whether the packaging is just there to inform you, or can it transform your experience? The session includes results from exciting research Sarah Hyndman is currently involved in with the Crossmodal Research Laboratory, University of Oxford. Are you looking for a winter warming treat with your friends, or a unique and entertaining event for your team and clients? Join us for an innovative type and wine tasting experience and take a journey of discovery through a selection of superb wines as you explore what the design of the label tells you about what you drink. How much does a bottle cost? If it looks expensive will you enjoy it more? What does the type tell you about its provenance? 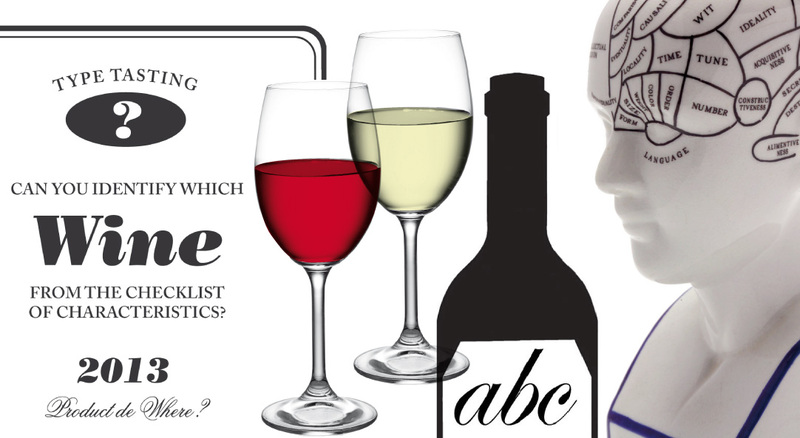 Try your hand at wine and font pairing as you identify the key flavours. Ultimately is the label just there to inform you, or can it transform your tasting experience? Would you like us to host a wine & type tasting for your Christmas do? Find out more. We had a fantastic Wine and Type Tasting event at Laithwaite’s Arch with Bankside Design District for the London Design Festival. Here is a glimpse of the evening, all the photos are by David Owens. There will be a second tasting on Tuesday 27th September and a Christmas one is planned on 8th December. Find out more here. “Surprising and very interesting” Richard, “Fascinating” Cherry, “Illuminating” Piers, “Intriguing” Clare, “Very different but rewarding” Lee, “Fun and informative” Sara, “Really interesting! Surprisingly scientific” Rachael, “It was fabulous, surprising and delicious!” Syd. Type Tasting founder Sarah is on a mission to make typography fun and engaging for everybody, not just designers. She specialises in making the complex topic accessible with originality, humour, a dash of theatre and lashings of audience participation. She delivers interactive talks and events with games and demonstrations that inform, entertain and challenge your preconceptions. Sarah has created a programme of four exciting events for the London Design Festival this year. Each event takes a unique approach to exploring type: discover how it influences us as type consumers; create customised letterforms from different times in history; learn how to choose fonts and use type to communicate effectively; taste the connection between type and all your senses (whilst enjoying delicious wine).